The Marcus Bonfanti Band hit the stage launching straight into Cheap Whisky, Goin’ Down and Will Not Play Your Game. Bonfanti had the crowd eating out of his hand right from the start to the dying chords of the final number 90 minutes later. Marcus Bonfanti is a very charismatic young musician whose passion for the Blues and his music is infectious it is hard not to be moved by his songs and sheer enthusiasm for playing live with his talented band. Bonfanti engaged the crowd with banter and some funny stories which went down well. Marcus is a lively performer who can’t keep still, the way he kept moving was reminiscent of Chuck Berry and Angus Young which was really good to see. Bonfanti played songs from both of his albums and the new strictly limited edition Medicine Man EP. The new EP was recorded as a stopgap because he felt that the length of time between second album What Good Am I To You? and recording the new album was too long. Bonfanti played a few new songs Honest Boy, Long Haired Country Boy and Alley Cat to test them out on his fans and the songs went down really well. These songs are going to be on the third album, if the rest of the album is anything as good as these new tracks then album number three is going to be a blinder. The set ended with the classic Give Me Your Cash before returning to encore with Sweet Louise on his own and the band returned to join Bonfanti on the superb Jezebel. 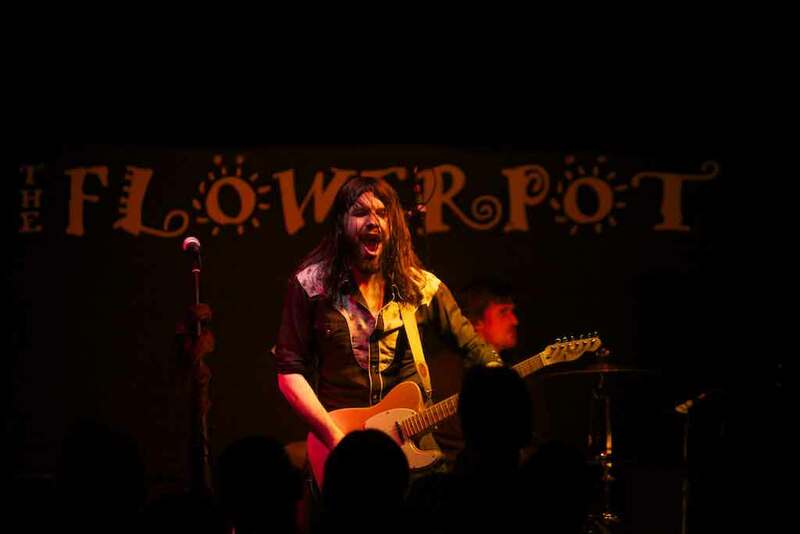 Marcus Bonfanti thanked the fans and also Raw Promotions for putting on the gig and promised to be back saying just how much he loves playing The Flowerpot. Bonfanti is a superb live performer and is a definite must see.